For other uses, see Peter Frampton (disambiguation). Peter Kenneth Frampton (born 22 April 1950) is an English-American rock musician, singer, songwriter, producer, and guitarist. He was previously associated with the bands Humble Pie and The Herd. After the end of his 'group' career, as a solo artist, Frampton released several albums including his international breakthrough album, the live release Frampton Comes Alive!. The album sold more than 8 million copies in the United States and spawned several hit singles. Since then he has released several major albums. He has also worked with Ringo Starr, David Bowie and both Matt Cameron and Mike McCready from Pearl Jam, among others. Frampton is best known for such hits as "Breaking All the Rules", "Show Me the Way", "Baby, I Love Your Way", "Do You Feel Like We Do", and "I'm in You", which remain staples on classic rock radio. He has also appeared as himself in television shows such as The Simpsons and Family Guy. Frampton is known for his work as a guitar player and particularly with a talk box and his voice. Peter Kenneth Frampton was born in Bromley, Kent, UK. He attended Bromley Technical High School, at which his father, Owen Frampton, was a teacher and the head of the Art department. He first became interested in music when he was seven years old. Having discovered his grandmother's banjolele in the attic, he taught himself to play it, going on to later teach himself how to play guitar and piano as well. At the age of eight, he began taking classical music lessons. His early influences were Cliff Richard & the Shadows (featuring guitarist Hank Marvin) and American rockers Buddy Holly and Eddie Cochran and later The Ventures, Jimi Hendrix and The Beatles. His father introduced him to the recordings of Belgian gypsy jazz guitarist Django Reinhardt. By the age of 12, Frampton played in a band called The Little Ravens. Both he and David Bowie, who was three years older, were pupils at Bromley Technical School (where his father Owen Frampton was Bowie's art instructor). The Little Ravens played on the same bill at school as Bowie's band, George and the Dragons. Peter and David would spend lunch breaks together, playing Buddy Holly songs. At the age of 14, Peter was playing with a band called The Trubeats followed by a band called The Preachers, produced and managed by Bill Wyman of The Rolling Stones. He became a successful child singer, and in 1966 he became a member of The Herd. He was the lead guitarist and singer, scoring several British pop hits. Frampton was named "The Face of 1968" by teen magazine Rave. In 1968, when Frampton was 18 years old, he joined with Steve Marriott of Small Faces to form Humble Pie. While playing with Humble Pie, Frampton also did session recording with other artists, including: Harry Nilsson, Jerry Lee Lewis, and John Entwistle's Whistle Rymes, in 1972. Pete Drake introduced him to the "talk box" that was to become one of his trademark guitar effects. After four studio albums and one live album with Humble Pie, Frampton left the band and went solo in 1971, just in time to see Rockin' The Fillmore rise up the US charts. He remained with Dee Anthony (1926-2009), the same personal manager that Humble Pie had used. His own debut was 1972's Wind of Change, with guest artists Ringo Starr and Billy Preston. This album was followed by Frampton's Camel in 1973, which featured Frampton working within a group project. In 1974, Frampton released Somethin's Happening. Frampton toured extensively to support his solo career, joined for three years by his former Herd mate Andy Bown on keyboards, Rick Wills on Bass, and American drummer John Siomos. In 1975, the Frampton album was released. The album went to No. 32 in the US charts, and is certified Gold by the RIAA. Peter Frampton had little commercial success with his early albums. This changed with Frampton's best-selling live album, Frampton Comes Alive!, in 1976, from which "Baby, I Love Your Way", "Show Me the Way", and an edited version of "Do You Feel Like We Do", were hit singles. The latter two tracks also featured his use of the talk box guitar effect. The album was recorded in 1975, mainly at the Winterland Ballroom in San Francisco, California, where Humble Pie had previously enjoyed a good following. Frampton had a new line-up, with Americans Bob Mayo on keyboards and rhythm guitar and Stanley Sheldon on bass. Wills had been sacked by Frampton at the end of 1974, and Bown had left on the eve of Frampton Comes Alive, to return to England and new fame with Status Quo. Frampton Comes Alive was released in early January, debuting on the charts on 14 February at number 191. The album was on the Billboard 200 for 97 weeks, of which 55 were in the top 40, of which 10 were at the top. The album beat, among others, Fleetwood Mac's Fleetwood Mac to become the top selling album of 1976, and it was also the 14th best seller of 1977. With sales of eight million copies it became the biggest selling live album, although with others subsequently selling more it is now the fourth biggest. Frampton Comes Alive! has been certified as eight times platinum. The album won Frampton a Juno Award in 1977. The success of Frampton Comes Alive! put him on the cover of Rolling Stone, in a famous shirtless photo by Francesco Scavullo. Frampton later said he regrets the photo because it changed his image as a credible artist into a teen idol. In late 1976, he and manager Dee Anthony visited the White House at the invitation of Steven Ford, the president's son. On 24 August 1979, Frampton received a star on the Hollywood Walk of Fame for his contributions to the recording industry at 6819 Hollywood Boulevard. Frampton's following album, I'm in You (1977) contained the hit title single and went platinum, but fell well short of expectations compared to Frampton Comes Alive!. He starred, with The Bee Gees, in producer Robert Stigwood's poorly received film Sgt. Pepper's Lonely Hearts Club Band (1978). Frampton's career seemed to be falling as quickly as it had risen. He also played guitar on the title song of the 1978 film Grease, a song newly-written for the film by Barry Gibb. Frampton suffered a near-fatal car accident in the Bahamas in 1978 that marked the end of his prolific period and the beginning of a long fallow period where he was less than his old self. He returned to the studio in 1979 to record the album Where I Should Be. Among those contributing to the album were past band members Stanley Sheldon (bass), Bob Mayo (keyboards/guitar/vocals), and John Siomos (drums/vocals). In 1980, his album Rise Up was released to promote his tour in Brazil, although he suffered another serious setback that year when all his guitars were thought destroyed in a cargo plane crash that killed three people. 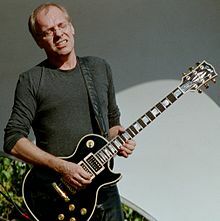 Among the instruments he lost was the black Les Paul Custom which he had named "Phenix" (pictured on the cover of Frampton Comes Alive) given to him by Mark Mariana and first used on the night of the recording of the Humble Pie live album Performance, and which he had used all through his early solo career. The guitar was recovered and returned to him in December 2011. The album eventually turned into Breaking All the Rules, released the next year in 1981. These albums were the first he recorded almost completely live. In 1982, following the release of The Art of Control, Frampton tried unsuccessfully to split his ties with A&M Records; he, however, re-signed with the label in 2006 and released his Grammy Award-winning Fingerprints. Although his albums generally met with little commercial success, Frampton continued to record throughout the 1980s. He did, however, achieve a brief, moderate comeback of sorts in 1986 with the release of his Premonition album, and the single "Lying", which became a big hit on the Mainstream Rock charts. Most notably, he also united with old friend David Bowie, and both worked together to make albums. Frampton played on Bowie's 1987 album Never Let Me Down and sang and played on the accompanying Glass Spider Tour. Frampton would, in 2013, credit his participation in this tour for helping revive his career. Looking for the band experience again after touring with Bowie, Frampton kept referencing Steve Marriott, and at the beginning of 1991 rejoined his old Humble Pie mate for some shows (Marriott's last English gigs) at the Half Moon in Putney, London. The chemistry was still there for a while, as both Frampton and Marriott laid down some tracks in L.A. and prepared to do a "Frampton-Marriott" tour. However, Marriott abruptly returned to England in April and he died in a house fire less than 24 hours after his return. Broken up by Marriott's death, Frampton went off the road for a time, then reformed his old touring band with his old friends Mayo and John Regan. At least three songs, and possibly a fourth, from the ended Marriott-Frampton partnership were subsequently recorded; two ending up on Frampton's "Shine On" compilation, a third on his subsequent solo album. In 1994, Frampton wrote and released the album Peter Frampton, the final version of which contained material recorded on Tascam cassette recorders. Originally released on the Relativity label, this record was re-released in 2000 by Legacy Records, with four bonus tracks and additional notes by Peter. In 1995, Frampton released Frampton Comes Alive! II, which contained live versions of many of the songs from his 1980s and 1990s solo albums. Frampton Comes Alive! II was accompanied by a video release on DVD, recorded at The Fillmore Theatre on 15 June 1995. Although there was a large amount of marketing for the album, it did not sell well. After Frampton Comes Alive! II, he recorded and toured with Bill Wyman's Rhythm Kings and Ringo Starr's All-Starr Band, where he and Jack Bruce performed a cover version of Cream's "Sunshine of Your Love". In 2003, Frampton released the album Now, and embarked on a tour with Styx to support it. It was on this tour in 2004 he lost good friend and long time bandmate Bob Mayo. He also toured with The Elms, and appeared in 2006 on the Fox Broadcasting variety show Celebrity Duets, paired with Chris Jericho of WWE fame. They were the first pair voted out. On 12 September 2006, Frampton released an instrumental work titled Fingerprints. His band consisted of drummer Shawn Fichter, guitarist Audley Freed, bassist John Regan (Frampton's lifelong best friend,), and keyboardist-guitarist Rob Arthur, and guest artists such as members of Pearl Jam, Hank Marvin, and his bassist on Frampton Comes Alive!, Stanley Sheldon – the only member of the backing band on that album still alive. On 11 February 2007, Fingerprints was awarded the 2007 Grammy Award for Best Pop Instrumental Album. In February 2007, he also appeared on the Chicago-based PBS television show Soundstage. Frampton released his 14th studio album, Thank You Mr. Churchill, on 27 April 2010. In summer 2010 he began touring North America with the English band Yes; the two acts had played stadium shows on a bill together in 1976. His 2010 band consisted of Rob Arthur (keyboards, guitar, backing vocals), John Regan (bass), Adam Lester (guitar), and Dan Wojciechowski (drums). He embarked on a UK Tour in March 2011 in support of his new album, visiting Leamington Spa, Glasgow, Manchester, London and Bristol. Frampton went on tour in 2011 with The Frampton Comes Alive 35th Anniversary Tour that showcased and followed exactly the songs on the play list for the original tour from 1976, recorded for the famous Frampton Comes Alive! The concerts each night started with the prerecorded thump of a microphone being turned on, familiar to many fans of the album, followed by the recorded voice of Jerry Pompili saying, "If there was ever a musician that was an honorary member of San Francisco society, Mr. Peter Frampton"...and then the crowd goes wild. He played the album song for song for 69 locations between 15 June 2011, and 22 October 2011, throughout the US. On 11 June 2011, Frampton performed a live set for "Guitar Center Sessions" on DirecTV. The episode included an interview with program host Nic Harcourt. In 2013, he performed throughout North America as part of the "Frampton's Guitar Circus" tour which featured periodic guest performers including B.B. King, Robert Cray, Don Felder, Rick Derringer, Kenny Wayne Shepherd, Steve Lukather, Sonny Landreth, David Hidalgo, Mike McCready, Roger McGuinn and Vinnie Moore. On 9 February 2014, Frampton was one of several musicians to participate in The Night That Changed America: A Grammy Salute to The Beatles tribute to The Beatles on the 50th anniversary of their first appearance on American television. On 23 June 2014, Frampton released a new album entitled Hummingbird in a Box. On 11 June 2015, Frampton announced his new studio album: Acoustic Classics; then, on 14 January 2016, he launched the first song: a version of "Do You Feel Like I Do". On 22 February 2019 Frampton announced his Peter Frampton Finale—The Farewell Tour commencing on 18 June 2019 in Tulsa, Oklahoma, running through 12 October ending in San Francisco California. The tour features special guest Jason Bonham's Led Zeppelin Evening, as well as Peter's son Julian Frampton on the West Coast stops. He also revealed the reason for the farewell tour; he's received a diagnosis that he has inclusion body myositis (IBM), a progressive muscle disorder characterized by muscle inflammation, weakness, and atrophy (wasting). In 1974, Frampton appeared in the movie The Son of Dracula as a guitarist in The Count Downes. In 1978, Frampton portrayed the character Peter Buckley in an episode of Baa Baa Black Sheep titled "A Little Bit of England". In 1978, Frampton played Billy Shears in the movie Sgt. Pepper's Lonely Hearts Club Band starring along with the three brothers Gibb of the band the Bee Gees. The movie was inspired by The Beatles album of the same name. Critics were hostile, and the film was a box-office failure. In 1988, Frampton appeared in the video release of David Bowie's Glass Spider tour. In 1996, Frampton appeared in an episode of The Simpsons entitled "Homerpalooza", in which he played "Do You Feel Like We Do". He also made a TV appearance in the Family Guy episode "Death Lives", in which Peter Griffin asks Death to bring Peter Frampton to play "Baby, I Love Your Way" to his wife. Also in 2000, Frampton served as a technical advisor for Cameron Crowe's autobiographical film Almost Famous. He wrote some of the songs performed by the fictional band "Stillwater" in the film, supplied guitar tracks, and was the guitar instructor for Billy Crudup, who starred as Russell Hammond, the guitarist for the band. Crudup is quoted as saying, "Who could ask for a better tutor than Peter Frampton?" As an inside joke, he also appears briefly in the film as "Reg", a road manager for Humble Pie, Frampton's real-life former band. In 2001, Frampton appeared as himself in Drew Carey's Back-to-School Rock 'n' Roll Comedy Hour, in which he performs "You Had To Be There" and appears in a brief scene with Mimi, in which he recalls their past relationship. On 20 December 2006, Frampton appeared on The Colbert Report. Stephen Colbert had a fake feud with The Decemberists to be decided by a head cutting duel. When Colbert faked an injury, Colbert called on Father Christmas to supply a guitar hero, at which point Frampton appeared and won the shred-down. Frampton played a supporting role in a GEICO TV commercial, where he performed a small portion of "Do You Feel Like We Do". On 23 April 2010, Peter Frampton became the all-time celebrity champion of the trivia game called No Apparent Reason, with five correctly answered questions on the nationally syndicated Mark and Brian Radio Program originating from KLOS Los Angeles. However, on 5 May 2010, Frampton was reduced to second place after only two short weeks by Luke Perry's answering six questions correctly. On 4 November 2010, Frampton appeared on The Oprah Winfrey Show as one of her favourite musicians. On 21 October 2011, Frampton was honoured at Music City's at Walk of Fame Park in Nashville, Tennessee. In 2012, Frampton appeared as himself in a Buick Verano commercial. On 22 July 2012, Frampton appeared on a segment on CBS Sunday Morning. On 6 January 2019, Frampton appeared as himself on "Madam Secretary", where he performed a small portion of "Baby I Love Your Way". Frampton has been married three times and has three children. His first marriage was to Mary Lovett, from 1972 to 1976. He was sued by Penelope J. "Penny" McCall in 1978 for palimony. McCall asked for half of Frampton's earnings during the five years that they were together. According to McCall, she gave up her job as a rock promoter and devoted herself full-time to Frampton, just as he achieved superstar status. A New York judge ruled that Frampton and McCall never intended to marry each other and "never held themselves out to the public as husband and wife" and dismissed her complaint on the grounds that to act otherwise would condone adultery. The case set precedent in New York. From 1983 to 1993, Frampton was married to Barbara Gold, with whom he had two children named Jade and Julian. The latter co-wrote and sang on Frampton's song "Road to the Sun" from Thank You Mr. Churchill. His third marriage was on 13 January 1996 to Tina Elfers, with whom he had a daughter, actress Mia Frampton, and a stepdaughter named Tiffany Wiest. Frampton filed for divorce from Elfers in Los Angeles, California on 22 June 2011, citing irreconcilable differences.Frampton has one step-grandson, Wolfie, via Tiffany. In June 1978, Frampton was involved in a near-fatal car accident in the Bahamas and suffered broken bones, a concussion, and muscle damage. Dealing with the pain of the accident led to a brief period of drug abuse. Frampton has lived in London and various U.S. locations, including Westchester County, New York; Los Angeles, California; and Nashville, Tennessee. He moved to Indian Hill, Ohio, a suburb of Cincinnati, in June 2000. This is the birthplace of his ex-wife Elfers and the city in which they were married in 1996. They chose to live there to be closer to Elfers' family. He currently lives in Nashville. Frampton cites the September 11 attacks as his reason for becoming a U.S. citizen and seeking the right to vote. He is a vegetarian. ^ a b "Gold & Platinum". RIAA. Retrieved 4 January 2017. ^ "Peter Frampton, Beckenham Hall of Fame". Beckenham TownTalk. 22 April 1950. Retrieved 8 March 2012. ^ a b c d e f g h i j k "Peter Frampton History – 60's/70's". Frampton.com. Archived from the original on 16 October 2013. Retrieved 11 March 2014. ^ Gosling, Emily (24 August 2012). "Teaching David Bowie". Design Week. Retrieved 1 January 2017. ^ a b c "50 years of Peter Frampton". Enquirer.com. 4 February 2001. Retrieved 11 March 2014. ^ "A Slice of Humble Pie: Peter Frampton's Underrated Band Deserves Another Listen". Howard Stern. The Howard Stern Production Company, Inc. Retrieved 4 January 2017. ^ Giles, Jeff. "How Peter Frampton Met the Talk Box". Ultimate Classic Rock. Retrieved 4 January 2017. ^ Crowe, Cameron. – "Frampton: Rock Star of the Year". – Rolling Stone. – 10 February 1977. – RS232. ^ Greenblatt, Mike. "Peter Frampton." Goldmine 37, no. 10 (09, 2011): 60-64. ^ "Peter Frampton | New Music And Songs". MTV. 22 April 1950. Retrieved 11 March 2014. ^ "Peter Frampton: Still a guitar man". Jacksonville.com. 13 October 2006. Retrieved 11 March 2014. ^ Eder, Bruce. – Frampton Comes Alive!. – AllMusic. ^ "Pictures and Photo Galleries". Rolling Stone. Retrieved 11 March 2014. ^ "No fade in Frampton's future". Enquirer.com. 4 February 2001. Retrieved 11 March 2014. ^ "Random Notes". – 16 December 1976. – RS228. ^ "Peter Frampton | Hollywood Walk of Fame". www.walkoffame.com. Retrieved 14 June 2016. ^ "Peter Frampton". latimes.com. Retrieved 14 June 2016. ^ "Gibson Guitars: "Peter Frampton On Wanting to Find a New Guitar, Not Wanting to Be Alive, and Definitely Not Wanting to be Eric Clapton"". Gibson.com. Retrieved 29 January 2018. ^ McKinnley Jr., James C. (3 January 2012). "Peter Frampton Reunited with 'Best Guitar' After 31 Years". New York Times. Retrieved 3 January 2012. ^ a b "Peter Frampton History – 80's". Frampton.com. Archived from the original on 15 October 2013. Retrieved 11 March 2014. ^ "Grammy awards". allmusic.com. Retrieved 17 December 2008. ^ a b "Peter Frampton History – '90s". Frampton.com. Archived from the original on 17 April 2014. Retrieved 11 March 2014. ^ "FOX Broadcasting Company: Celebrity Duets: Recaps". web.Archive.org. 4 October 2006. Retrieved 24 February 2019. ^ "Daily News – Articles & Info on Health, Money, Social Security, Medicare, Politics – Bulletin Today". Bulletin.aarp.org. 7 March 1965. Retrieved 8 March 2012. ^ "Peter Frampton | Guitar Center Sessions". Sessions.guitarcenter.com. Retrieved 11 March 2014. ^ "Vinnie Moore Interview". Guitarhoo!. Guitarhoo.com. 15 December 2013. Retrieved 21 February 2014. ^ "Peter Frampton | Live". Frampton.com. Retrieved 11 March 2014. ^ "Hummingbird In a Box: Songs For a Ballet - Peter Frampton - Songs, Reviews, Credits, Awards - AllMusic". AllMusic. Retrieved 31 August 2015. ^ "Peter Frampton Announces New Acoustic LP, Endorses Crowdfunding Campaign for New Guitar Tuning System". ^ Danton, Eric R. (14 January 2016). "Peter Frampton Puts Solo-Acoustic Spin on 'Do You Feel Like I Do' (Exclusive)". ^ "PETER FRAMPTON ANNOUNCES FINALE - FAREWELL TOUR". Music News Net. Retrieved 24 February 2019. ^ "Peter Frampton reveals rare muscular disease is why his next tour will be his last". CBS News. 23 February 2019. Retrieved 24 February 2019. ^ "Peter Frampton Honored". Getty Images. Archived from the original on 1 November 2011. Retrieved 11 March 2014. ^ "Peter Frampton Leaves Mark on Divorce and Family Law". John K. Grubb & Associates, July 6, 2011. Retrieved 29 March 2016. ^ "Live-In Lovers' Quarrel". People, 7 May 1979. Retrieved 29 March 2016. ^ "Ministry of Gossip". Los Angeles Times. 23 June 2011. Retrieved 23 June 2011. ^ "Peter Frampton has moved to Nashville | Arts in Focus". Cincinnati.com. Archived from the original on 11 March 2014. Retrieved 11 March 2014. ^ "Peter Frampton on 'Frampton Comes Alive! 35' and Becoming a U.S. Citizen: 'I Wanted to Vote' | Anglophenia". BBC America. 27 October 2011. Retrieved 18 April 2014. ^ Spartos, Carla (21 April 2010). "Celeb chefs dish on the stars". Nypost.com. Retrieved 27 May 2010.